I had heard of the Lubavitcher Rebbe prior to meeting him. Nothing prepared me, however, for meeting him in person. 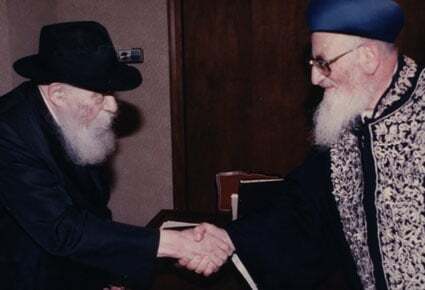 It was in 1986 when I had my second meeting with the Rebbe—together with the Ashkenazi Chief Rabbi of Israel, my colleague Rabbi Avraham Schapiro. It was 1 a.m., but despite the late hour and a full day of communal activities, the Rebbe was completely alert. The conversation covered all sections of the Torah: the Talmud, Jewish law, Kabbalah, etc. The Rebbe jumped effortlessly from one Talmudic tractate to another, and from there to Kabbalah and then to Jewish law... He was clear in all the subjects discussed and organized in his delivery. It was as if he had just finished studying these very topics from the holy books. The whole Torah was an open book in front of him. The Rebbe's reasonings and answers to our in-depth queries were of the sort that I had never previously experienced—clear and brilliant. There are those who have a vast all-encompassing knowledge of all sections of the Torah; but they usually do not possess an in-depth and deep understanding of the material. To meet a great mind that had both great knowledge as well as depth was a unique experience, an exceptional and rare phenomenon. From where does one derive such energy, such talents? Bear in mind that the Rebbe didn't sit and learn the entire day—though even had that been the case, such scholarship would be unique. A great part of the Rebbe's time was devoted to Jewish activism. I can testify that the Rebbe worried about every Jew across the globe, and was active in all areas of goodness and charity, both spiritual and physical. From where does one derive such energy, such talents? I felt that the Rebbe was a holy person endowed with a special soul. He wasn't an individual for himself, as it were, he was the all-encompassing soul of the Jewish nation. In the course of my lifetime I've met many rabbis and Jewish leaders. Some were brilliant in all sections of the Torah, some were leaders who brought great changes to the Jewish nation, and some were righteous individuals whose blessings worked great miracles. But I never met an individual who encompassed all these three: brilliance in Torah; great leadership, with emissaries across the globe; and miracles and wonders happening all around him. The Rebbe's talks on the weekly Torah readings always contained a novel approach that enriches our understanding of the text. "Why should we lose out? Why are we prevented from offering G‑d's sacrifice in the appointed time," complained the Jews who could not bring the Paschal sacrifice in its proper time, the eve of Passover, due to their impurity. G‑d then designated a later date—those who could not bring the Paschal lamb before Passover could do so on the "Second Passover," a month later. The Rebbe offers a novel explanation that has implications on and illuminates our daily lives. If those Jews, says the Rebbe, had not voiced their protest of "Why should we lose out?" today we would not have a Second Passover. But Moses heard the Jews protest "Why should we lose out?" and he saw that it pained them. Seeing their pain, he was pained too. In pain he turned to G‑d, certain that G‑d would respond with a solution that would allow these individuals to have another chance. We cannot just sit quietly; we must all ask "Why should we lose out?" Why should we not be a part of the Jewish tradition to the fullest degree possible—every individual on his or her level? And when we protest, G‑d arranges the possibilities and capabilities to fully participate. And the footnotes on the Rebbe's published talks highlight his brilliance. He intertwined so many sources in his Torah talks. I have asked: What does a man who was born in Russia and resides in Brooklyn have with Moroccan Jews in Casablanca? What does an Ashkenazi rabbi in the United States have with Sephardic Jews in Morocco? What motivated him to come to their aid? I have one answer. It is because he felt for every single Jew. He was concerned for every individual and for the entire Jewish nation, not just a certain group; and every single person was important to him. He wanted all Jews to follow their parents' traditions, whether it was Ashkenazi or Sephardic. An example: During our audience in 1986, the Rebbe requested that the chief rabbinate of Israel organize public Passover Seders in every city, so that people who could not attend another Seder could enjoy a communal one. Those Passover events attracted Jews who had never before attended a Seder. Upon seeing the great public interest in this initiative, we worked on broadening the program—which, thank G‑d, is active in many cities and communities until today. Now, why did the Rebbe have an interest that Jews in Israel should join a Jewish event? But he did care. He cared about those that otherwise would not join a Seder. Why did the Rebbe have an interest that Jews in Israel should join a Jewish event?He said that he is worried about the "fifth son," the one that does not come on his own to the Seder. The entire Jewish nation was always before his eyes. His emissaries, who can be found across the globe, are doing amazing work. The Rebbe is the only leader I am aware of who sent away his most talented students to far off cities to reach out to the Jews in those communities. In our private conversations we spoke about many issues—many of which cannot be revealed until this very day—regarding the unique challenges that face the Jewish nation. It was intriguing that the Rebbe knew minute details of what was happening in the land of Israel, as if he lived in Israel. He knew for example that in this and this city there are issues with the mikvah (ritual bath), or that they need assistance in a certain communal area. There are so many instances of this happening in our audiences, written correspondence and phone conversations. And through our various meetings I came to understand that he knew what was happening across the globe just like he knew what was happening in Israel. He knew the issues that affected every country and city—as if he lived there. I needed to thank him for the honor, and instead he thanked me. There are no words to express the great honor that the Rebbe bestowed on me. The merit of meeting him and the fact that he escorted me outside following my fourth and final audience. His final words made a great impression on me. After an hour and a half of conversation, the Rebbe expressed his gratitude and thanked me for coming. I needed to thank him for the honor, and instead he thanked me. 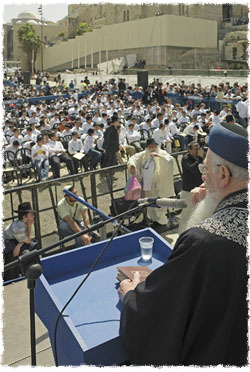 Rabbi Eliyahu speaks to 1,000 bar and bat mitzvah boys and girls at a grand celebration in honor of their coming of age. 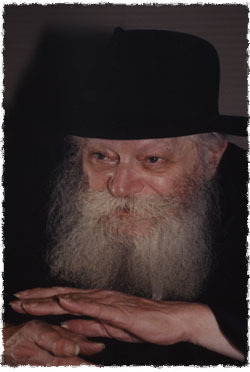 The yearly event is organized on the anniversary of the Rebbe's birth. The Rebbe never minced his words when he was concerned about a particular issue. What he stated, however, was always with love and a special care. The Israeli leaders knew that the Rebbe loved them with all of his heart, and hence they knew that when the Rebbe rebuked them, he did it for the love of the Jewish nation and with love for every single individual. I remember once when the Rebbe learned of a scheme to personally humiliate one of the Israeli prime ministers. He made every effort to stop the individuals from doing so. To rebuke their actions, yes; to humiliate them, no. It takes special strength to rebuke and love at the same time. This power comes from the teachings of Chabad philosophy and its predecessor, Rabbi Israel Baal Shem Tov, the founder of Chassidism. The Rebbe did not see a sinful Jew; the Rebbe brought Jews closer, he embraced them for who they are and brought them closer to their Jewish roots. Though he was a brilliant scholar, he actively cared about even the simple unscholarly individuals. During our four audiences, the Rebbe always sought out the merit of others. 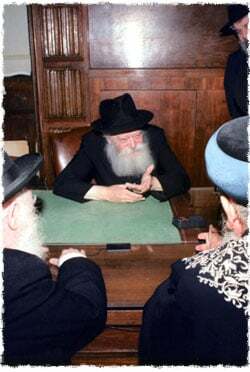 No matter the subject we were discussing, the Rebbe steered the conversation so that he could praise others. G‑d showed kindness to our generation by giving us the Rebbe. I was worried, however, that after the Rebbe's passing the structure that he built would, G‑d forbid, crumble. But thank G‑d there is a continuation. There is a Chabad House in every place that I visit. Everywhere in the world, even in the farthest location, Chabad is there—even more than before his passing. There is a continuation. I miss the Rebbe; it is painful to go to the Rebbe's gravesite. But the Rebbe left us his teachings, instructions how to continue in his ways We need to constantly examine our actions and ask ourselves: Is this what the Rebbe would tell me to do? We should envision the Rebbe looking at us, and ask ourselves: What would he say? Would he approve? We need to act as if we are standing in the Rebbe's presence. The Talmud says that "Jacob our father did not die." The Talmudic sages then ask, what does it mean that he did not die? They buried him, they eulogized him! The Talmud explains that since his children are alive, he too is alive. Through the children doing good deeds and following in his footsteps, Jacob is still alive. The Rebbe's children are his students. 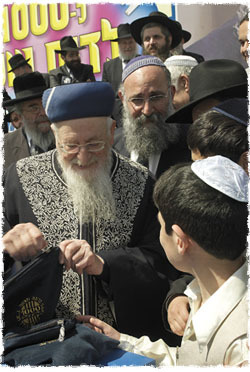 They continue to spread Judaism as he wanted; the Rebbe is alive through them. I miss the Rebbe; it is painful to go to the Rebbe's gravesite. But the Rebbe left us his teachings, instructions how to continue in his ways—and Chabad is following his direction. As told by Rabbi Mordechai Eliyahu. 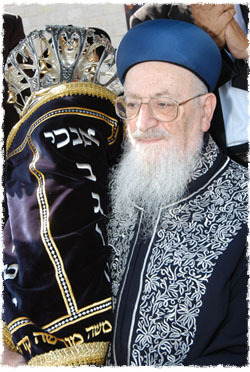 Rabbi Eliyahu is the former Sephardic Chief Rabbi of Israel (1983-1993), an eminent descisor on Jewish law and the author of more than twenty volumes on halachah. After The Rebbe The example set by The Rebbe is one which can guide every Jew who wishes to take upon him/her self the responsibility of living a life in which one's every thought is imbued with the goal and desire to live life as a concerned and grateful Jew: concerned for one's fellow Jews everywhere, and grateful that the opportunity exists, even in this complex present-day world. The greatness of the Rebbe should be an inspiration to those who follow him, so that, venerated though he may be, The Rebbe's greatest achievement would be that his successor be a man inspired and knowledgeable, loving and devoted, innovative and aware.